TAMPA, Fla. -- Like the prizefighter who won his first championship battle only to be beaten down again and again and again, Haiti always struggles to stand up and fight once more. “When you read about the 1791 revolution and beyond, it turns out to be current. There are many lessons to be apprehended from Haitian ancestors about what is going on today,” she said. And now there’s a new president to add to Haiti’s unfolding story. He acquired the nicknames “bad boy of kompa,” “Tèt Kale” (bald head) and "Sweet Micky" on his rise to stardom as a carnival star and seemed an unlikely national leader. But it’s official, Michel Martelly is the president-elect of Haiti and takes office in mid-May. Like many successful presidential candidates before him, Martelly was swept into office on the promise of change -- with 67 percent of the vote, though only about 20 percent of those eligible cast their ballots according to press accounts. Some blame the low turnout on supporters of exiled leader Jean-Bertrand Aristide for staying away in protest. On Twitter he’s @PresidentMicky. Does that make him a modern president for a new Haiti -- different from his more recent predecessors? Simeon-Jones said time will tell. 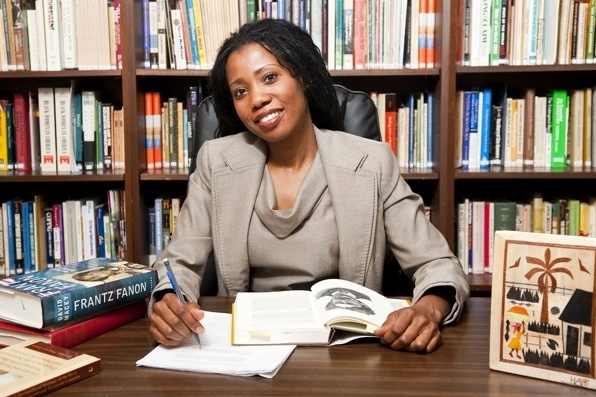 Her research and writings explore leadership in the Black Diaspora and she teaches her students about Haiti‘s tragic story of plundered resources, leaders with personal agendas and too many different players who have not be been genuine in their concern for the Haitian people. Martelly’s switch from musician to politician seems to make sense at this point in Haiti’s history, according to Simeon-Jones, at a time when people are hungry for something different. An article she wrote in 2009, appearing in the spring 2011 edition of Negritud: Journal of Afro-Latin American Studies, now seems prescient. In “Haiti’s Politico-Cultural Transcript: Moving toward National Rehabilitation,” she noted, “Faced with Haiti’s dire predicament many musicians use their art as a platform to challenge, inspire, counsel and invite their audience to become engaged in the socio-political process.” Martelly was a case in point, then as entertainer-turned-politician, he became an even more powerful example. She examined his very own words in her analysis of the role Haiti’s culture -- literature, music, plastic art and painting -- plays in influencing political thought on socio-political transformation. They may provide an indication of what to expect from him. Simeon-Jones is happy to see a strong leader taking charge -- with a caveat. She points out that strong leadership can work in either of two ways and hopes Martelly’s strength will be used to take a stand for his people nationally and internationally as opposed to using his strength to oppress the people and follow in the footsteps of other, corrupt leaders. Everything takes time in Haiti. The election timeline has been a long one. The first round of voting took place Nov. 28, the run-off, March 20. Preliminary results were promised for March 31, and then delayed until April 4. Final results were delivered April 16 and Martelly is set to be sworn into office May 14. The Jan. 12, 2010, earthquake that killed 300,000 of Martelly’s fellow Haitians followed by the cholera epidemic that took 4,600 lives last year and left 1.5 million homeless, have all added to Haiti’s already dire circumstances and made the need for effective leadership all the more urgent. The international community has been waiting and watching for a smooth transition in leadership and it is hoped the desperately-needed remaining two-thirds of the $5 billion pledged for earthquake relief finally will start to flow. Can Haiti make a fresh start? History doesn’t inspire much hope. “Haiti has had no chance to flourish within its unique set of circumstances,” Simeon-Jones said. “There has been outright international sabotage since the very beginning, and internal corruption throughout the 20th century. Such observation should not be viewed as placing the blame on foreign powers, nor should it be viewed as rhetoric to absolve Haitians of their responsibilities, but part of the political and economic history of the country. “In my class we’re sharing ideas that help dispel myths and put Haiti in perspective,” she said. And to help do so she has her students reading The Black Jacobins by C.L.R. James and Haiti State Against Nation, by Michel-Rolph Trouillot for the best grounding in Haiti’s history. Things are looking up in a way. Renée Préval has made history, as he himself pointed out, by being the first Haitian president in 25 years to leave office without being jailed or exiled. His successor has a lot to contend with though. His country of 9 million people has one of the largest gaps in the world between the haves and the have-nots. The economy depends heavily on remittances from the 1.5 million Haitians who live and work outside of the country -- during a time of widespread recession. And tourism, once its mainstay, has declined significantly. These were more than likely some of the topics on the agenda when Martelly recently met with U.S. Secretary of State Hillary Clinton and the heads of the World Bank and the International Monetary Fund. The 50-year-old Martelly will be scrutinized closely and compared to all those who have gone before him. Like other celebrities who have assumed political office -- Ronald Reagan, Jesse Ventura and Arnold Schwarzenegger -- he will have to work hard to be taken seriously, at least until he either confirms or refutes the doubters with his actions. And hurricane season is on the horizon.